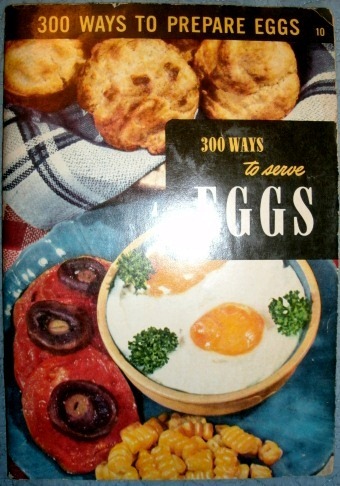 On these pamphlets, the CAI’s motto was “One of America’s foremost organizations devoted to the science of Better Cookery.” That puts it squarely in the home economics trend of the period, and as far as CAI was concerned, there were hundreds of ways to cook anything. Heat butter and soup in top of double boiler. Add cheese and cook until melted, stirring constantly. Arrange halves of hard-cooked eggs (cut lengthwise) in buttered baking dish. Pour cheese mixture over the eggs. Sprinkle with cereal flakes. Brown under boiler. Serves 6. I don’t think I’ll be trying that one any time soon. 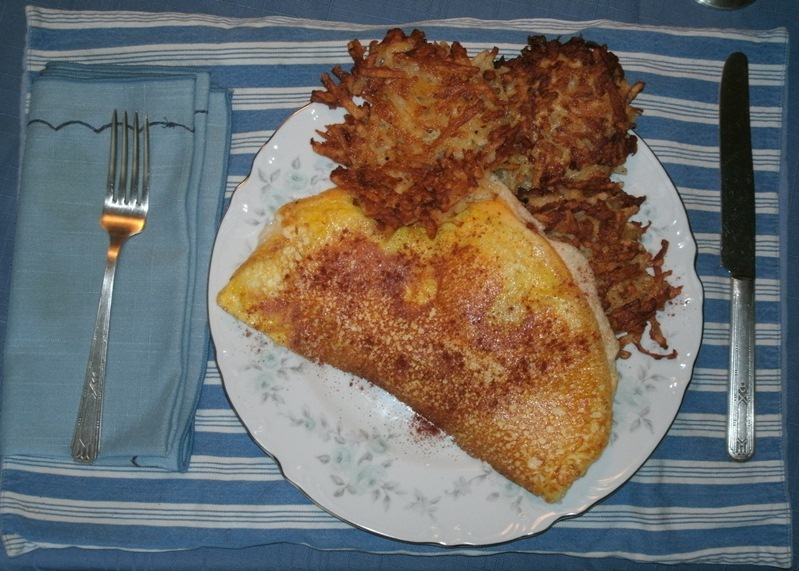 It did, though contain a worthwhile-looking variation on the basic omelet, which we gave a try last week. Beat egg whites until stiff. Beat yolks until thick and lemon colored, beat hot water [I used hot tap water] into them and add salt and pepper. Fold yolks and stiffly beaten egg whites together. Melt butter in omelet pan, grease bottom and sides of pan. Turn egg mixture into pan, cover and cook over low heat until it is puffy and a light brown underneath, then place in a moderate oven (350°F) for 10 to 15 minutes [it took a LOT less time than this] or until top is dry. Touch the top of the omelet lightly with the finder and if the egg does not stick to the finger the omelet is done. Do not overcook it or it will shrink and be tough. Loosen the edges of the omelet, cut it through the center, slip a spatula or flexible knife under the side next to handle of pan, fold 1/2 over the other press lightly to make it stay in place, slip onto a hot plate and serve at once. Serves 6. Basically, it’s an omelet with two cooking steps instead of one. I was quite interested to learn that somehow, my husband had never before observed the magical nature of stiffly beaten egg whites. He was suitably impressed. Since we cook a lot in cast-iron pans, putting the pan into the oven was straightforward. We tried doing it in two batches, though, and discovered that the mixture has a definite tendency to start separating, so although I found I could gently fold the mixture back together again, a one-batch approach is probably best. I rather doubt it would all fit in a standard omelet pan, though; we plan to use the big frying pan next time we make this. The recipe actually worked quite well, though it needs fairly strong flavoring with salt and spices, or a good savory filling, because by itself the egg mixture is rather bland, like trying to eat a cloud. But the puffiness was the point, and with cheddar cheese folded in and some paprika on top it was excellent. Not something I’d do every day, and with all the egg beating involved it’s more of a two-person job than your typical omelet. Definitely a success.